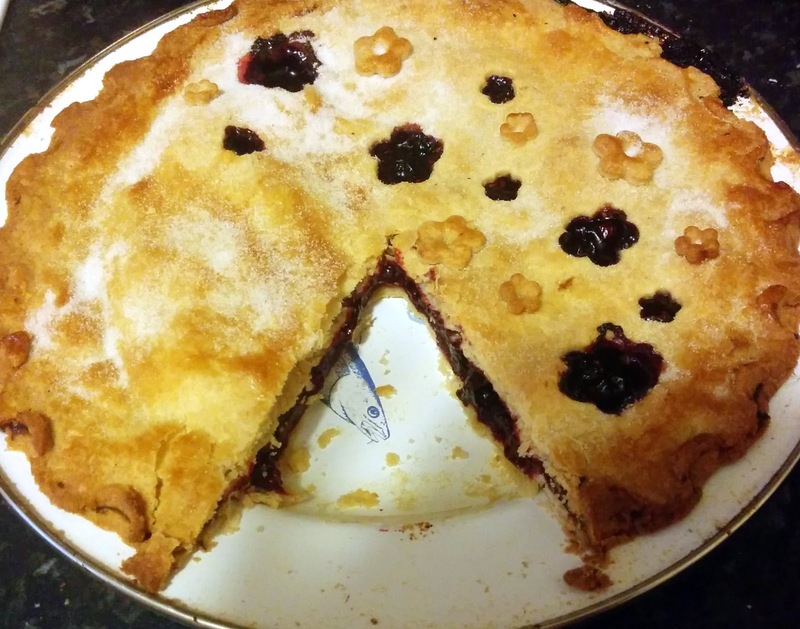 Mixed Berry Pie Recipe – Where Is My Teaspoon? Mondays can either be great or just drag and today was definitely the latter for me. It’s only eight now and I’m already in bed – where I belong you might say! This week is hopefully going to be a quiet one for me work wise which should give me enough time to get through the rest of my assignment and finally finish my diploma. Please please please! This week actually marks 2 years in my current job as a marketing executive and 2 years in England! How time flies by when you’re not looking. I haven’t really mentioned too much about why I ended up moving here and it’s something I’ll explain later in the month, but basically I was only meant to stay for 12 weeks originally and now 2 years later I’m still here. Hopefully we will celebrate at work with some coffee and cake if I get around to making one. I always think it’s so important to mark these occasions, whether it is 1 year or 20. The idea for this mixed berry pie pie actually came from Instagram. I think I saw a photo earlier in the year and just knew this is something I wanted to learn how to do and definitely something I wanted up on Where Is My Teaspoon? 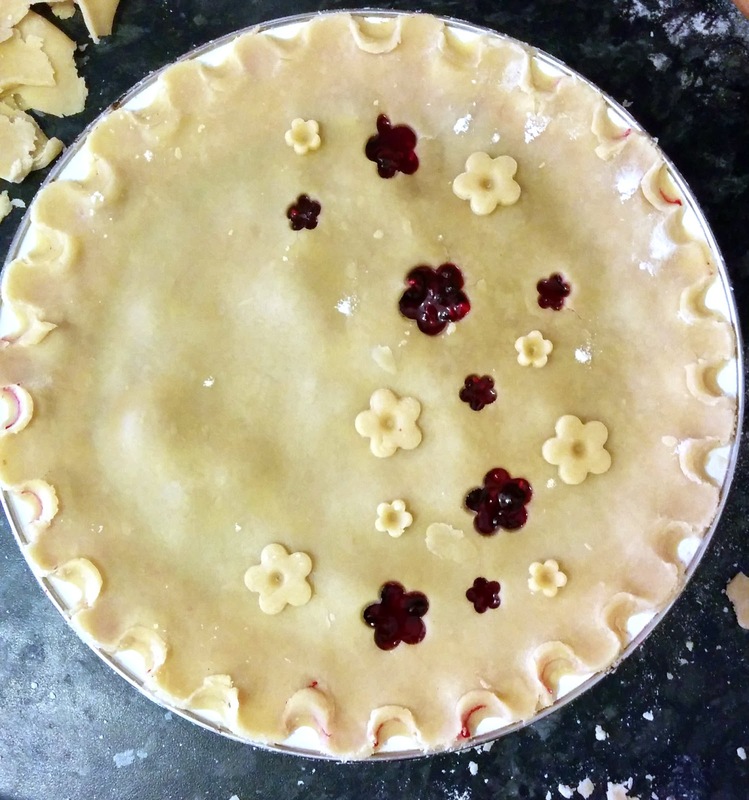 This home made pie is so pretty and so simple. Honestly, I was so pleased when it finally came together and love the peak of red underneath the crust. You do need some flower cutters to make this design but you can get them in basically any kitchen shop. I just got little pastry ones in a couple of different sizes. Firstly, grease and flour your pie dish and set aside. Make the pastry by rubbing the flour and butter in together until it resembles breadcrumbs. Add a couple of tbsp of cold water and bring it all together into a dough. Using your hands to bring it together, gently knead the dough and cut it in half. Pop the pastry into the fridge while you make the filling. Place the frozen berries into a saucepan along with the cornflour and sugar. Heat gentle with the occasional stir. You don’t want to break the berries down too much as you’re not making a jam. The fruit should become glossy and the liquid from the berries will slowly thicken up. Check the filling now for sweetness, if you’re happy add the almond essence and turn off the heat. Allow to cool down while you roll out the pastry. Roll out the base of your pastry and place on your pie dish. If you are worried about getting a soggy bottom, sprinkle a little cornflour on the base and rub it all around with your hands. This should help absorb any extra liquid and protect your base. Spoon the filling onto the base and spread out so it looks even. 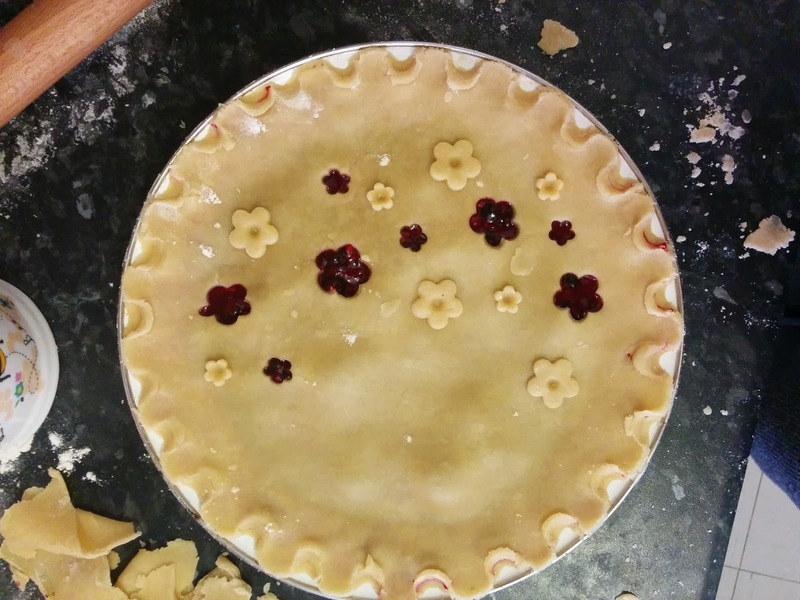 Roll out the lid of the pastry and using the flower cutters, make your design. Roll it up and place on top of the filling. Press down firmly along the rim of the dish and push in sections to make a scallop design. Brush gently with egg wash (less is more as you don’t want it to burn) and bake in the oven for 25-30 minutes. Allow to cool for a little while until serving with fresh cream and a sprig of mint. I hope you give this a go over the summer – it would make an absolutely lovely hostess gift for a BBQ or a summer party. Previous Post I seek shelter + comfort.